Chicago is currently home of two exhibits that should not be missed, one of a Chinese dissident artist and the other of a local artist undiscovered until his death. Both share a few things in common. Both had hard childhoods and when it comes to their art, if not for the circumstances of their making, neither would likely be worthy of being exhibited. But that is a moot argument, for it is precisely the circumstances around both that make them art. The Chicago Ambassador will leave the debate about whether they constitute fine art or not alone but will strongly state that both artists have something to say and should be heard. Both exhibits also are free of charge. 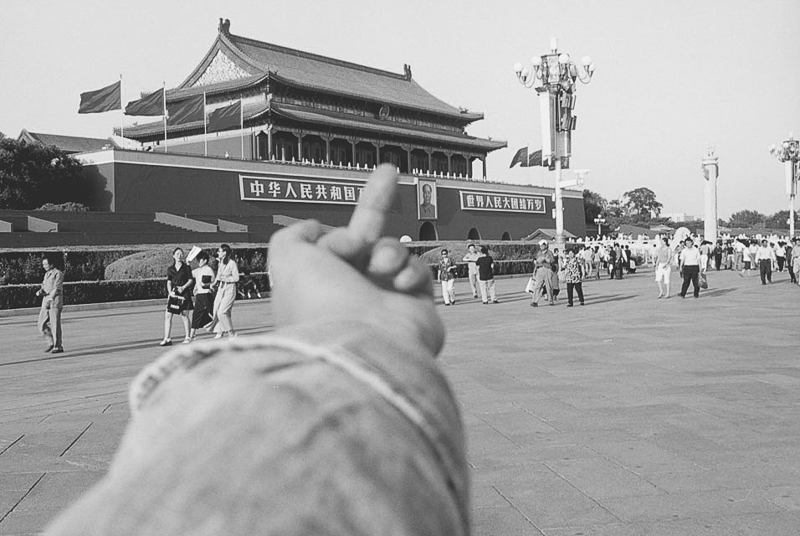 The first, currently on exhibit through July 2, is the work of Ai Weiwei at the Museum of Contemporary Photography at Columbia College, 600 S. Michigan Avenue. Ai Weiwei documents the dropping of a 2000-year-old Han dynasty urn. One of the world’s most provocative artists, Ai has for over thirty years blurred the boundaries between art and politics, often at great personal risk. Designed by Ai specifically for the Museum of Contemporary Photography at Columbia College, the exhibition #AiWeiwei traces the evolution of the artist’s voice as he fine- tunes and expands his artistic responses to state power and geopolitics, from his own burgeoning political consciousness in New York’s East Village avant-garde of the 1980s, to his current global photo activism. Ai Weiwei was born in Beijing at the dawn of the Anti-Rightist Movement (1957–59), a series of campaigns initiated under Chairman Mao Zedong to purge from the Communist Party of China’s alleged “rightists,” who were viewed as favoring capitalism. Of the over half million people persecuted for spreading “bourgeois values,” Ai’s father, the renowned poet Ai Qing, was one. In 1958, Ai’s family was exiled to a labor camp in northeast China, and later to Xinjiang, where Ai Qing was forced to clean communal toilets for his village of about two hundred people throughout the Cultural Revolution (1966–76). Growing up, Ai lived with his family in a hole dug in the ground. Only upon Mao’s death in 1976 were they free to move back to the capital. Ai enrolled in the Beijing Film Academy in 1978 and became a founding member of the avant-garde art group the Stars. Facing artistic repression, he soon moved to the United States, landing in New York City in 1983, where he first began recording his daily life. During this time, Ai worked a series of odd jobs and opened his apartment to other Chinese artists such as Tehching Hsieh and Wang Keping, the filmmaker Chen Kaige, and composer Tan Dun—many of whom he had first met as a student at the Beijing Film Academy and all of whom are now world-renowned artists. Ai’s early black-and-white photographs reflect his experiences and world-view from that period and document the gritty East Village neighborhood and the artists, such as poet Allen Ginsberg, he befriended there. They also capture his burgeoning political consciousness. His 1988 protest photographs of the Tompkins Square Park Riots appeared in many publications, including the New York Times, the New York Daily News, and the New York Post. In 1993, when his father fell ill, Ai returned to China for the first time in over a decade to care for him. Having become accustomed to photographing on a daily basis in New York, he naturally continued recording his life back in Beijing. e 1990s were a particularly fruitful time for experimental art in China and Ai was at the heart of it, making work with a focus on traditional materials and documenting the urbanization and transformation of Beijing into the global capital it is today. One of Ai’s important artworks made during this period is a photographic triptych documenting his intentionally dropping a 2,000-year-old Han dynasty urn. The bold performance instantiated a popular Communist slogan from China’s Cultural Revolution: “Scatter the old world, build a new world.” Growing up during the Cultural Revolution, Ai Weiwei experienced the effects of the revolutionary slogan directly, including the obliteration of artistic freedom, prompting him to reflect on what is gained and what is lost as he produces a new artwork from the shattering of an ancient one. In Study of Perspective, another provocative series of snapshots begun in 1995 and continuing through today, Ai flips his middle finger at monuments, landmarks, and institutions of cultural and political power. Traditionally, artists have made perspective studies as preparation for illusionistic drawings or paintings of three-dimensional space on a at surface. Ai cannily uses the double entendre of “perspective” as he interjects his own point- of-view into photos of iconic landmarks in which his middle finger serves as both a universal symbol of protest and a device for evaluating the relationship of distant objects. The range of places represented in the project underlines the scale of human rights abuses across the world, and the ways in which symbols of patriotism and grandeur serve to mask exploitation. In 2006, Ai Weiwei began posting short essays and images to his blog, hosted on sina.com.cn until Chinese authorities shut it down on May 28, 2009. The website was a platform through which Ai spread news and information that was being suppressed by official government media, as he broadcast his political dissent. Ai used his blog, and now Twitter and Instagram, to publish not only thousands of selfies and other images but also his commentary, calling attention through everyday occurrences to political and social injustices in China and across the globe. Taken in Chengdu, China, in 2009, Illumination has become an iconic Ai Weiwei selfie, one embodying freedom and resistance. The year before Ai made this image, he had come under the spotlight for speaking out against the Chinese government’s use of the Olympics as propaganda, even though Ai himself had been one of the designers of the Olympic National Stadium, known as the Bird’s Nest. Nevertheless, when the stadium became a symbol of autocracy, rather than freedom, Ai boycotted the games. That same year, Ai was the leading activist calling for transparency in the investigations of fatalities during the Sichuan earthquake on May 12. The Chinese government would not reveal the number of students who had died due to the poor construction of schools that collapsed during the quake. With the help of a team of volunteers, who traveled throughout Sichuan province knocking on thousands of doors in villages near and far, Ai was able to post 4,851 names of the 5,335 students who had died. 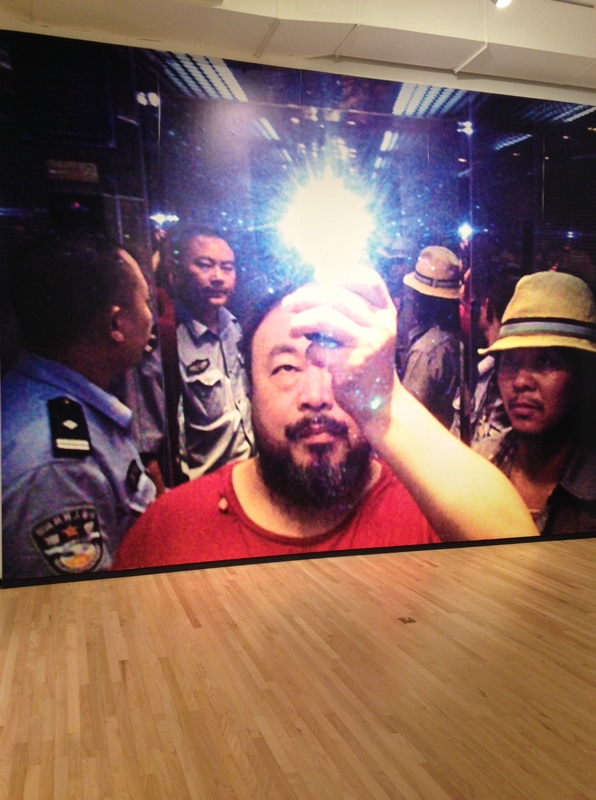 Ai Weiwei’s selfie taken in an elevator while being escorted by Chinese police is featured prominently at the exhibit. Ai was arrested a second time on April 3, 2011, at the Beijing Capital International Airport and secretly detained for eighty-one days. Upon his release, he lived under probationary conditions in Beijing, unable to travel outside of the country. His passport, which had been confiscated by the authorities, was not returned to him until July 22, 2015. In the interim, Ai lived under a constant state of surveillance, with his phones and computers tapped, and undercover agents following his every step. In an attempt to gain control, Ai began a series of experiments: taking pictures of the secret agents as they fumbled to pretend they were not following him; reversing the role of being followed by following his followers; peacefully placing Chinese lanterns on each of the surveillance cameras surrounding his home, drawing attention to their presence; or, in a de ant parody, setting up cameras in his house and studio and live broadcasting footage of his every move on the internet to “aid” the government in keeping an eye on him. The self-imposed scrutiny exposed the censorship and repression the artist was facing, yet it was short-lived. The government shut down weiweicam.com after only forty-six hours, but not before over 5.2 million viewers visited the site. 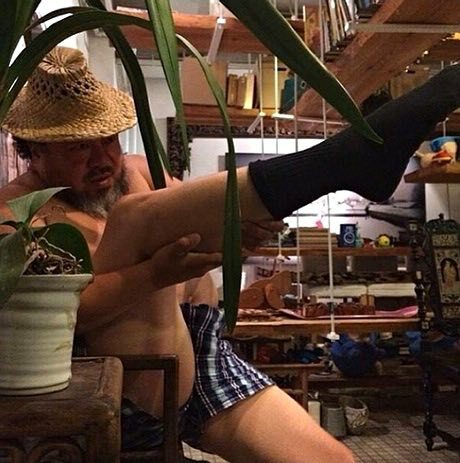 Shortly after the twenty-fifth anniversary of the Tiananmen Square Massacre, on June 11, 2014, Ai Weiwei shared a photograph of himself holding his leg out like a gun on Instagram and Twitter. The image was loosely based on a pose Ai had first encountered while watching a dance troupe from the Art College of Henan University reenact the ballet Red Detachment of Women, created by Jiang Qing, Chairman Mao’s wife, and first performed in the 1960s during the Cultural Revolution. The ballet dancers, dressed as female soldiers held their left legs up as if they were shooting rifles. Ai’s leg-gun stance suggests aggression, yet his weaponless body remains vulnerable. The picture recalls a visual history of human resistance to authoritarian rule—in particular, the iconic image of an unarmed Chinese student standing in front of four tanks sent to Tiananmen Square to forcefully quell protesters. Ai’s image quickly became an internet meme with thousands sharing their own interpretations of the pose, often adding hashtags such as #endgunviolence to their posts. The adaptability of Ai’s original post reveals the power of social media to engender resistance in the face of violence, both actual and implied. Having endured years of government surveillance, Ai Weiwei finally left China in 2015. He currently resides in Berlin, the epicenter of the global refugee crisis. A refugee himself, Ai is empathetic to the over one million migrants who have entered the European Union since 2015 fleeing war, terrorism, or famine in the Middle East and Africa. Compelled by their stories, the artist visited migrant camps and the shoreline of the Mediterranean Sea to bear witness to the point-of-arrival and living conditions of the many asylum seekers. In producing his documentary Human Flow, slated for release in 2017, Ai and his team visited over forty refugee camps in dozens of countries and Ai personally conducted over a hundred interviews, including conversations with refugees, doctors, NGO representatives, and politicians. During the year of filming, Ai used his phone to photograph his travels, amassing over 17,000 images of the people and places he encountered. The overwhelming number of images displayed reflects the indescribable scale of displacement and the impossibility of distilling the scope of human suffering into a tidy narrative. Intuit: The Center for Intuitive and Outside Art, 756 N. Milwaukee Avenue, currently has three exhibits dedicated to Henry Darger, a most curious Chicago character if there ever was one. 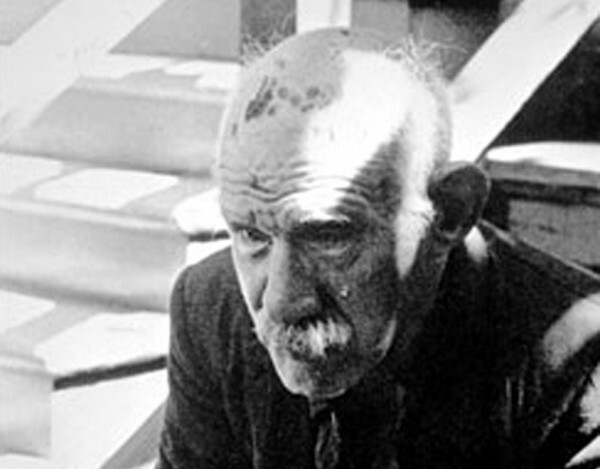 One of only two known photographs of Henry Darger. Darger, born in 1892 and died in 1973, was only discovered as an artist after his death. In his life, Darger was a reclusive man who worked as a hospital custodian in Chicago. He has become famous for his posthumously discovered 15,145-page, single-spaced fantasy manuscript called The Story of the Vivian Girls, in What is Known as the Realms of the Unreal, of the Glandeco-Angelinian War Storm, Caused by the Child Slave Rebellion, along with several hundred drawings and watercolor paintings illustrating the story.The visual subject matter of his work ranges from idyllic scenes in Edwardian interiors and tranquil flowered landscapes populated by children and fantastic creatures, to scenes of horrific terror and carnage depicting young children being tortured and massacred. Much of his artwork is mixed media with collage elements. Darger’s artwork has become one of the most celebrated examples of outsider art, that is, “art brut,” or art done by people on the outside of the established art scene, often psychiatric hospital patients and children. 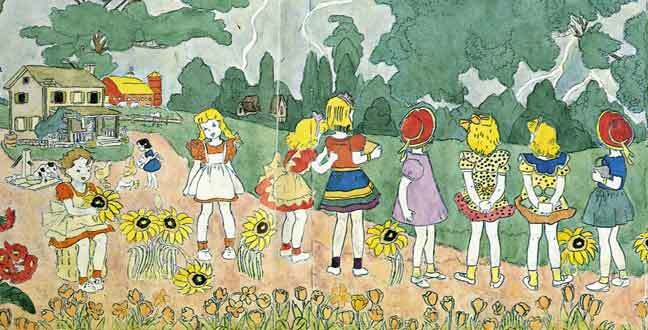 When he was four years old, his mother died after giving birth to a daughter, who was given up for adoption; Henry Darger never knew his sister. One of Darger’s biographers, the art historian and psychologist John M. MacGregor, discovered that Rosa had two children before Henry, but did not discover their whereabouts. A recreation of Henry Darger’s room at the Intuit. The first of the three Darger exhibits at Intuit, “Henry Darger: Author/Artist,” ends May 29 and features a juxtaposition of Henry Darger’s art and writings, giving the audience the ability to explore how the artist approached related subjects in different mediums. The second, “Henry Darger: Source Materials,” also ends May 29. 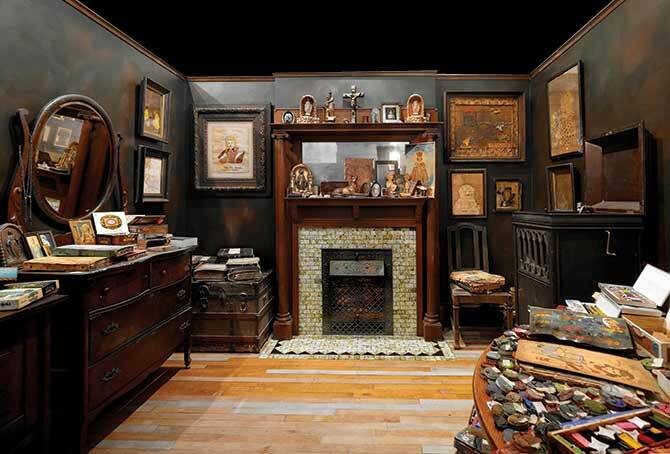 This exhibit features the contents of Darger’s living and working space. Intuit’s Henry Darger Room Collection includes tracings, clippings from newspapers, magazines, comic books, cartoons, children’s books, personal documents, and architectural elements, fixtures, and furnishings from Darger’s original room. The third Darger exhibit, “Betwixt and Between: Henry Darger’s Vivian Girls” runs through September 4. Darger’s Vivian girls and the thousands of others in his make-believe world exist in contradictory states; Darger positions these little “girls” somewhere between male and female, both biologically and socially. The Vivian girls’ ambiguous gender speaks broadly, and with rich complexity, to culture’s polarizing constructions of child/adult and male/female. Darger plays with these polarities and fabricates an extraordinary “child” beyond nature—capable of defeating bloodthirsty Glandelinians. The exhibition features major works by Henry Darger that include double-sided, panoramic drawings with watercolor and collage spanning up to eight feet long, Vivian portraits, as well as traced images and resource materials from Intuit’s archives. The Intuit will also have two additional upcoming Darger exhibits: “Henry Darger’s Orphans and the Construction of Race” will open from July 14 and “Darger + War” will run from September 15. Both will conclude January 7, 2018.